We are supporters of the democratic Syrian Revolution and opponents of military intervention from the outside. We oppose all attacks on civilians in Syria, whether committed by the Assad regime and its allies, by ISIS, by other jihadist groups, or by anyone else. We support the call for the removal of all foreign fighters from Syria: the anti-regime jihadis, the U.S. special ops forces, and the Turkish army, but also the Russians, Iranians, Hezbollah, and numerous Shiite militias backing Assad. It is a humanitarian and political imperative that the horrific bloodletting in Syria be brought to an end. There can be no doubt that the Syrian people have paid a terrible price for their struggle for freedom. They know the pain and suffering of being unable to feed their children, of being the targets of relentless and merciless bombing. We share their desire to see peace with justice in Syria. Unfortunately, the Kerry-Lavrov negotiations have thus far brought neither. The "agreement" being sold as a "peace deal" for Syria has thus far been a rotten bargain that extends the bombing. The wanton destruction of the aid caravan on September 19th brought the sorely unsuccessful "ceasefire" phase to a barbaric conclusion, and what is proposed to follow will be even worse - far worse. The Assad regime's forces continued their attacks throughout the so-called "ceasefire" of September 12th-18th. 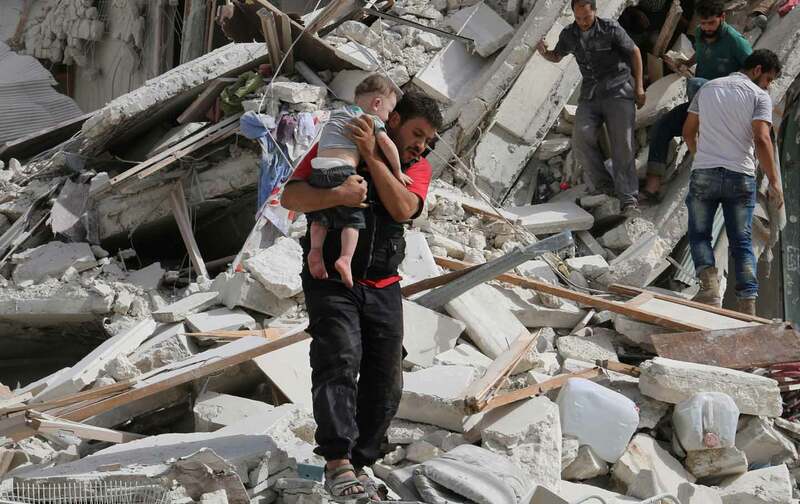 The day after the deal was announced, a hundred people died from regime attacks. On September 16th, regime warplanes targeted and bombed the White Helmets’ Head Quarters in Al Tamanna, rendering it inoperable. The sieges that seek to impose submission to the regime through starvation still affect hundreds of thousands, and promises to allow aid convoys to reach the besieged areas during the "ceasefire" never materialised. This demonstrates beyond all doubt that only air-drops of food will prevent the mass starvation of entire populations under siege. Millions have been driven from their homes as a result of Putin and Assad’s bombing campaign. Tens of thousands rot in Assad's torture-to-death prisons. These issues must be addressed to bring peace through justice to Syria. An expansion of the targets to be bombed by the US Coalition, and cooperation in bombing these targets between the US and Russia, which objectively means cooperation with the Assad regime, cannot bring Syrians peace nor justice. Stop the bombing! Don't expand it! Immediate airdrops of food to the besieged! UN Aid must reach the people, not be diverted to supply a war criminal regime! Aid to the hungry is non-negotiable! The peace and antiwar opposition can offer a real alternative to the expansion of the militaristic, never-ending and phony "War on Terror" by calling for an end to all bombing, including US bombing, and calling upon Russia and Iran to withdraw all support for the brutal Assad regime. Support for this regime enables ethnic cleansing and merciless attacks on unarmed civilians, on a nightmarish scale that is experienced by Syrians living in areas outside of regime control as a targeted genocide of Sunni populations within the opposition - an experience which is amplified by Assad's subsequent sectarian re-population of areas from which the besieged have been driven from their homes. This strategy can do nothing but breed sectarian division within Syria. Assad and Putin's campaign of collective punishment of civilian populations has produced a terrible humanitarian crisis. Peace activists have an ethical responsibility to oppose these crimes against humanity. Our commitment to justice demands we challenge all attacks on the dignity and human rights of the Syrian people. To be silent is only to facilitate the attacks. The peace and antiwar opposition can further promote a just solution to the terrible war in Syria by insisting that legitimate negotiations must include representatives from the Syrian democratic opposition, and these negotiations should have as their goal the ending of the bombing, the lifting of the sieges, and the freeing of all political prisoners. The Obama administration is leading a military intervention in Syria, and more broadly in the Middle East under cover of the War on Terror. The War on Terror is not only a cynical cover for US intervention in the Middle East; experience has demonstrated that it is counterproductive as a strategy to fight terrorism. In Syria, the violent sectarian forces have grown in strength directly as a result of the devastation wrought by relentless bombing. The democratic opposition to both the dictatorship and the violently sectarian forces is being crushed under barrel bombs, cruise missiles, cluster and phosphorus munitions, napalm and chemical weapons attacks. The peace and antiwar opposition can stand in solidarity with the democratic struggle by demanding an end to all bombing by all parties. The strategy of combating violent sectarianism through drone strikes and bombing results in the death of innocent civilians and is a recipe for a never-ending war. Without a single bomber dropping a single bomb, a major blow could be struck against violent sectarian forces by ending all military aid to the dictatorship in Egypt and to Israel, whose militaries should not be recipients of aid, and in an urgently needed display of human solidarity, redirecting the aid to provide for besieged Gaza and the Syrian refugees. Across the region external powers have been working to support undemocratic and oppressive regimes, whether in Yemen, Egypt, or Palestine. Under the Kerry-Lavrov deal, Washington and Moscow will be collaborating to maintain Assad in power. Solidarity with the democratic struggles is the alternative to occupations, war, dictatorships and violent sectarianism. Note: This is a statement on behalf of its signers, not of identifying organizations.